Monday was Memorial Day. We honored the men and women who died to keep us free. Lets not forget the the dogs who sacrificed too. Beagles are not typically used as military dogs because of their overdeveloped sense of smell, but German and Dutch shepherds and retrievers are used to detect bombs and booby traps, alert troops to snipers and other suspicious people, and find the wounded in hard to reach places. 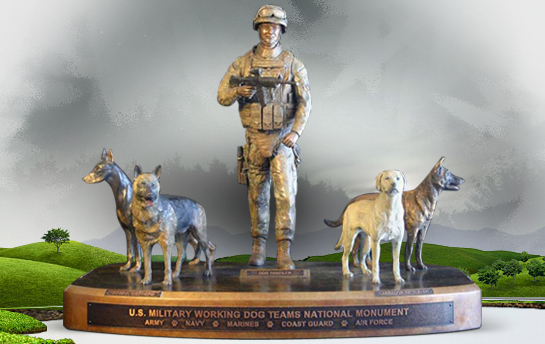 A memorial is expected to be unveiled next year in Washington for military dogs. The Military Working Dog Teams National Monument will feature bronze statues of the dog breeds that have helped our troops do their jobs since World War I. Right now the team behind it is collecting donations. If you would like to donate, head over to the website. Meanwhile, there is a bill in Congress to change the way military dogs are classified. Right now they are classified as equipment. The bill would change that to "canine members of the armed forces" and also to make it easier to adopt retired military dogs. The bill has support in the House, but needs help in the Senate. If you want to help, check out this article from the ASPCA. that is good! That's how dogs in the police force are handled. They are referred to as part of the force, as it should be! Yah, that I was surprised about. Why'd he have to leave him in Vietnam, Lee? The Lab was a latecomer for service. This needs to include several of the original military working dogs that helped to start it all: the Collie and the Airedale! !